Ergotron 33-299-195 simultaneously lifts and tilts two displays for maximum ergonomic comfort. This stand expands your computer desktop across two screens. *Works with most LCDs with diagonal screen-size up to 24". Stand can be used to hold a single widescreen display of up to 30", contact Ergotron for more information. NOTE 33% fewer errors reported when using multi-screen configurations; 24% of workers feel more comfortable when using multiple monitors. Source: NEC Display Solutions, University of Utah, ATI Technologies 2003 study, “Productivity and Multi-Screen Displays." Increases productivity and reduces errors - conclusion of scientific study of multi-monitor workstations. Easy to use - simple installation and effortless operation. Monitor Size Up to 24". Works with most LCDs with diagonal screen-size up to 24". 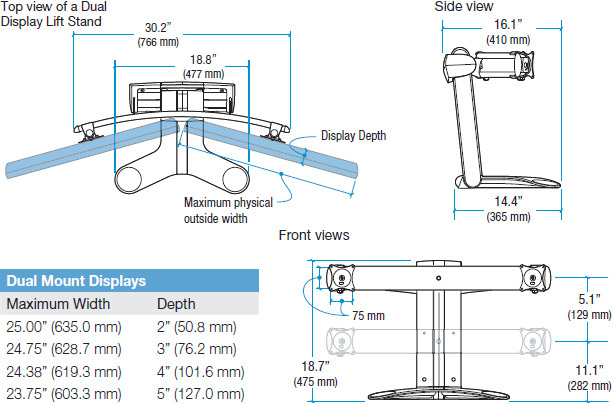 Stand can be used to hold a single widescreen display of up to 30", contact Ergotron for more information.